Nepal is a small nation located along the southern part of the Himalayas, between India and China. It is home to approximately 300 ethnic groups who speak many different languages and have a wide variety of religious beliefs. Recently, Nepal has been transformed from a monarchy into a parliamentary form of government. The Magar are one of the oldest known tribes in Nepal; however, their origin is unclear. They are believed to be of Tibetan descent because their language and dances are similar to those within the Tibetan culture. Some of the Magar live in the plains where the Himalayan hills begin. Others occupy the lower hills of the Mahabharat Lekh while a few inhabit the high altitude mountain areas. There are two major groups of Magar (the Eastern and Western) and which are further divided into a number of clans. The Magar language, which is divided into four groups, gives the people a distinct tribal identity. This linguistic classification is important in understanding the Magar tribes. Most Magar are craftsmen, although some who own their land have become farmers. Others work as miners, blacksmiths, or basket weavers. They tend to be hard-working, honest, self-reliant, and self-sufficient people. They are very jovial and love to sing and dance. They have several kinds of dances as well as tribal games that they frequently play. The Eastern Magar typically live in large, two-story stone houses with slate or thatch roofs. The homes are often constructed with large porches in front. The Eastern Magar have a unique style of dress. Most often, they wear loin cloths and bhotos (shirts with sleeves), or shirts and coats. The women also wear loin cloths called dhotis. They often adorn themselves with fulis (flower-like ear ornaments) in the middle parts of their ears and necklaces made of glass beads and silver Indian coins. Some aspects of western style clothing are slowly becoming more common. Magar marriages are arranged in a unique fashion. The groom's brother-in-law must go to the bride's family and offer a "bride price" of money and alcohol. If the proposal is accepted, further payments are then made. Marriages to maternal first cousins are the most common arrangements. The most distinctive element in the Magar family kinship is the strong bond between maternal uncles and their nephews. They treat each other with mutual respect because when the nephew is ready to marry, his bride will be chosen from among his uncle's daughters. "Life cycle rituals" are a very important part of Magar society. A special birth ceremony is held eleven days after a child is born. The baby is named and then washed for the first time. One festival known as Jyestha Poornima is observed in May or June at the time of the full moon. During the ceremony, freshly harvested grains are offered to the gods. The great majority of the Magar practice ethnic religions, while the minority are practicing Hindus. 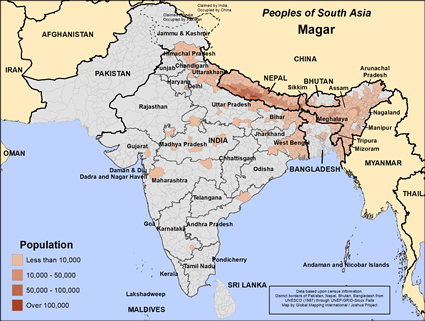 Like other Magar groups, Hinduism has greatly influenced the Eastern Magar. Many now worship the three major Hindu gods: Brahma (creator of the universe), Vishnu (protector and preserver of the worlds), and Shiva (the destroyer), as well as a host of other deities. The New Testament has been translated into the Eastern Magar language. However, the government of Nepal fiercely opposes any form of evangelism. Penalties against Christians sharing their faith have been harsh. Many believers have spent long periods of time in prison. Perhaps this explains why there are only a few known Eastern Magar believers. Nepal has long been hidden away and forgotten by most of the world. The government of Nepal is opposed to any form of proselytizing; and so government restrictions apply, but most of the time Christians can follow their religion. There are more problems from family members than from the government. Intercession is the key to breaking down the strongholds over these tribes and seeing them reached with the Light of the glorious Gospel. * Pray that the Lord of the harvest will thrust forth laborers into Nepal. * Ask God to give the few Eastern Magar believers opportunities to share the Gospel with their own people. * Pray that the Holy Spirit will open the hearts of Nepal's governmental leaders to the Gospel. * Ask the Lord to raise up strong local churches among the Eastern Magar.View Magar in all countries.